If you enjoy the the meals in our restaurants Aromi and La Finestra, you have now a unique opportunity to use our catering menu and enjoy your favorite dishes at home, in the office or even at an unusual place of your choosing. We focus mainly on Italian gastronomy. We prepare our menu based on the selection and freshness of our ingredients coming directly from our local suppliers in sunny Italy. We offer first-​class service with an emphasis on excellence, quality and authentic Italian hospitality. We would like to offer you, your family, friends and business partners an unique Italian gift from La Bottega bistros. We prepare the gift basket in accordance with your requirements, and can also help you with your choice. Take a look at our gift baskets offer at ebottega.lacollezione.cz. We are pleased to organize you a private cooking course led by experienced chefs, for up to 16 people. The course may be an interesting alternative to birthday parties, corporate party or an informal meeting with business partners. At the same time, you can choose from a selection of Cooking Courses prepared on different topics. The cooking courses take place in the premises of the new studio Laboratorio, Scuola di Cucina in Krocínova street , for example under the leadership of best chefs from the restaurant Aromi and La Finestra. We have prepared a gift voucher for a wonderful dining experience in Aromi and La Finestra, for purchases in the Italian bistros La Bottaga or cooking classes. 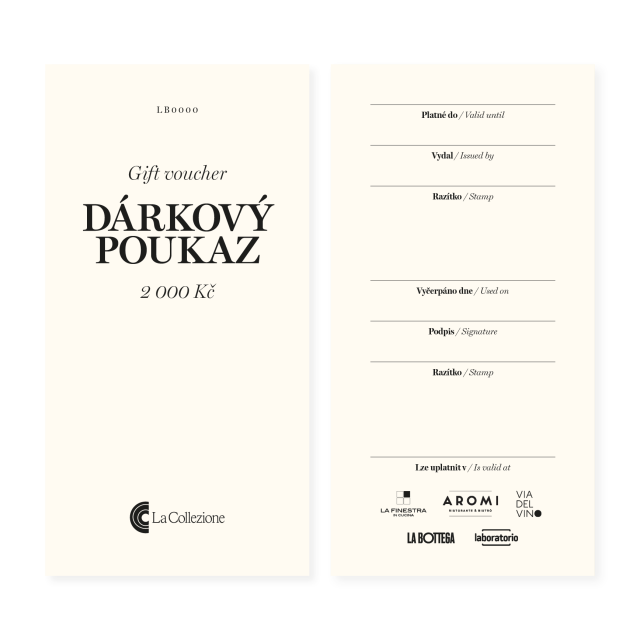 All gift vouchers can be also purchased at Aromi and La Finestra or in our La Bottega bistros. Vouchers are not transferable and not refundable.